Welcome to Week 25 of Paint Party Friday (Year 2) and to the next edition of our Featured Artist Series! (Would you like to be a PPF Featured Artist? Please click here for details!) This week's featured artist listens to her inner muse and invites us to do the same as she shares her inspiring intuitive paintings each week. Please welcome Petrea Hansen Adamidis! 1. Please tell us a bit about your personal history with painting. (When did you start painting? How has your painting evolved since you first started?) I started painting off and on about 25 years ago. My older sister was a clothing designer and I would join her at her craft shows with my decorative painted pots and boxes. I liked playing with textures and at the time painting marbling effect on walls and other surfaces was quite popular. 2. What are your favorite techniques, media, and tools to use in creating your paintings? Recently I have started to do art journaling which I quite enjoy, though because the paper is so much smaller, I paint very differently, a little more planned than usual. Sometimes I will use different objects as stencils (punchinella) or stamps, collage to give texture to the background. I also use mixed media. I love layering paint and taking away paint , or going over it with a wash so under layers show through. I will say though that my most favorite way of painting is on large paper, using acrylics. Sometimes I will get in there with my fingers to blend or add texture. When I paint this way I generally don’t have in mind what I am going to paint. It is very spontaneous. I find that when I am able to stay true to this process and spontaneity there is vibrancy, which comes through in the finished painting that is quite fulfilling. 3. What is your favorite thing to paint? Why? 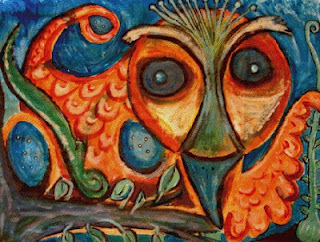 Although I don’t plan what I am going to paint, my paintings tend to be very nature focused with animals or creatures and organic growth swirled in there. Sometimes I will get an idea of something I want to paint, but often it morphs into something else. I generally love painting with bright colours. 4. What is your proudest painting moment and/or greatest painting achievement so far? I try not to compare my paintings to each other as I know that for me each one has it’s own significance and place in my life. That being said, the paintings I like the most tend to be the ones I was able to let myself go in, letting the paint brush lead me rather than me paint something preplanned. This owl "came out of nowhere" and I was really pleased with it when I was done because it felt very organic to me. 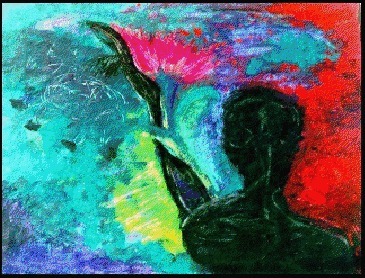 The painting seemed to be a turning point for me in terms of really letting go. I felt like the owl had an important message to tell me. 5. What's next in your painting future? After years of being on “Sabbatical” (I was busy with my kids and my clinical Art Therapy Work) I have finally come back to running my Art Therapy workshops, and have created a new one on Intuitive Process Painting called “Painting With Your Muse”. I held the first workshop in early August here in Toronto after running an e-course version online first! I am thrilled that I will be holding another “live” Painting With Your Muse workshop on October 20th in Toronto. As well on September 22 the 2nd round of Painting With Your Muse online will run for 5 weeks. Thank you for sharing your inspiring story with us, Petrea - We look forward to seeing a lot more from your inner muse! WE WANT YOU TO SUBMIT YOUR STORY! Hope you have a great week and if you are in North America a wonderful long Labour Day Weekend! 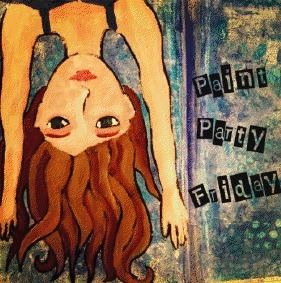 Welcome to Week 24 of Paint Party Friday (Year 2) and to the next edition of our Featured Artist Series! (Would you like to be a PPF Featured Artist? Please click here for details!) This week's featured artist paints playfully pretty girls and charms us with her creations weekly. Please welcome Catherine Denton! 1. Please tell us a bit about your personal history with painting. (When did you start painting? How has your painting evolved since you first started?) I've always been a bit of a perfectionist with projects and if I didn't think I could do it right, I wouldn't try it. About three years ago I went through a metamorphosis of life and realized doing things perfect isn't really an option. I decided to ease myself into doing things I'd dreamed of by simply playing. I bought paint, paper and canvas and just started painting like a preschooler. The colors, the feel of paint, and the ways it could change from one moment to the next caught my heart. I was hooked! 2. What are your favorite techniques, media, and tools to use in creating your paintings? Bubble wrap, drawer liners, old wallpaper, masking tape and acrylic paints. I love to layer! 3. What is your favorite thing to paint? Why? Girls. It feels like I'm telling my story, so I suppose my protagonist has to be a girl like me. 4. What is your proudest painting moment and/or greatest painting achievement so far? 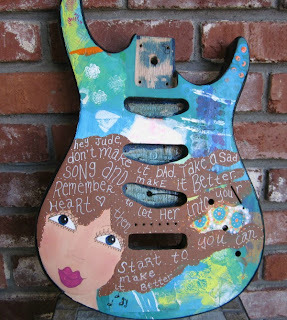 I recently painted a guitar for a friend. It was challenging and took me much longer than I'd anticipated. But I loved his expression when he saw it, so happy. Then his band went on the morning news and he played the guitar. The camera man shot a beautiful close up that had me beaming. 5. What's next in your painting future? I've been working on a series of twins that I'm super excited about. 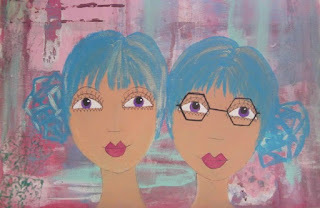 Having a twin sister, it's been fun to see my own childhood seep into the paintings. or browse my shop (www.artworkbycatherine.etsy.com). 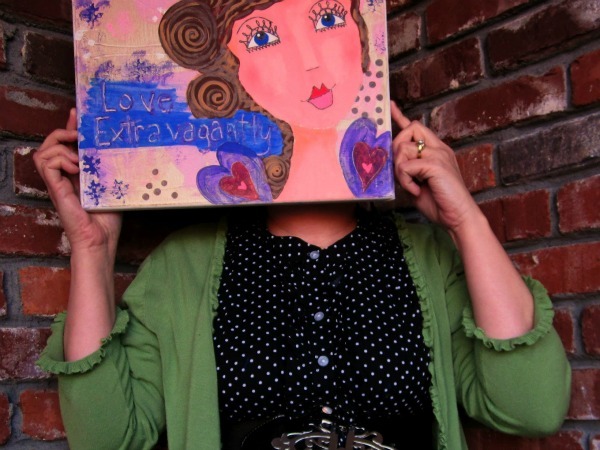 Thank you Catherine for sharing your story and your paintings of joyful girls (with those amazing eyelashes) with us. Welcome to Week 23 of Paint Party Friday (Year 2) and to the next edition of our Featured Artist Series! (Would you like to be a PPF Featured Artist? Please click here for details!) 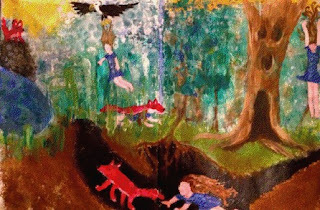 This week's featured artist has a wonderfully adventurous spirit when it comes to painting and inspires us with her experimentation and talents weekly. Please welcome Liz Powley from Gumnut Inspirations! Please tell us a bit about your personal history with painting. (When did you start painting? How has your painting evolved since you first started?) I discovered I could draw when I was 7 years old. However, despite studying art all through school and then graphic design in college, I never really started to explore painting until I was 37, a couple of years ago. I’d made a few attempts over the years at various points, some watercolour in high school, a single oil painting at 19 (a portrait) and a small rash of abstracts in 2001, but other than that I’ve never painted before. Certainly not to the extent I am attempting now. My most successful works prior to 2010 were in watercolour pencil, in an exacting, detailed method that took forever and sometimes had me hating the work long before it was finished (if it was lucky enough to be finished). So really, I’m a painting newbie. What are your favorite techniques, media, and tools to use in creating your paintings? I am in love with my acrylics at the moment. After lots of reading to educate myself on their physical properties, how they can and can’t be used, and scraping together the money to fully equip my studio with both thick and thin acrylics, I can now say that this is a paint that works well with my working style. I can do anything with it! It is such a flexible and forgiving medium. And the additives you can use to create specific textures and finishes…my mind is just crazy inspired by the possibilities. My techniques range from traditional to outright experimental. At the moment I’m attempting my first portrait in acrylics, detailed, lots of glazing and taking ages. But at the same time, I’ve been sitting on my couch at night gluing beads and gems to a painted canvas board and then adding chopped up prints of textures I have created using bubblebath, kids’ acrylics and a straw – a completely unplanned abstract paper mosaic. Basically I’m an artist in search of her art. But I think I’m the closest to finding it than I have ever been. What is your favorite thing to paint? Why? It changes all the time, usually bouncing back and forth between realistic and abstract. I’m making an effort to break away from realistic in the extreme, simply because one of my goals has been to free up my art from ‘what is expected’ or ‘what I should do’ and let myself do what I want to do and damn the consequences. It has been very freeing. I’m a strong believer that half the art equation is state of mind. But then I find myself returning to realistic from time to time to simply explore technique and my strength with the medium. Testing myself to see what I’m now capable of (hence the portrait I’m doing now). I love colour and light. I love the natural world. You won’t find many buildings or cars or man-made objects in my art. I’m not a fan of hard-edged perspective, mainly because I need more practise (it is my nemesis). I like atmosphere and mood. I have an interest in portraiture, but am not a fan of drawing the human body. This is something I am thinking of fixing. The difficulty in the human body is creating the feeling of life and movement, something I have failed to master. Practise should fix it and you may see some stumbling attempts of mine in the future. I’m also interested in exploring how to channel emotion into my art. I can write emotion, but have yet failed to do the same with paint. I’m also curious about creating movement and expression. What is your proudest painting moment and/or greatest painting achievement so far? This is going to sound lame, but I recently completed a painting for my eldest daughter. I posted it here several times over its quite long development period and I would like to thank all those wonderful people here who egged me on and took the time to comment on my blog. It is now hanging in her bedroom, fully varnished, signed and dated. It will last for a long time, and barring disaster, could be handed down to her children and grand children. To start is fun, but to finish is ecstasy. I’m just really happy that I saw it through. Too many things get half done and lay around unfinished, and it was just nice to have a final and complete product for no better reason than as a random gift for my daughter. Other than that I’ve created a mural for the Unley Libraries which covers a wall of their children’s section, I won a competition in college and had a poster printed from that, and I created a couple of very large watercolour pencil paintings for a friend several years ago that she framed and kept on her walls. But right now, ‘Sofie the Mermaid’ holds a more important place in my heart. What's next in your painting future? Exploration! Experimentation! Anything I feel like doing. On the more practical side of things, I’m hoping to add a lot more to my website. I want to do more tutorials, explore video, finally get that gallery up I’ve been meaning to add for ages. I have never really held an exhibition or really sold any work, so both of those are on the long term agenda. I have a number of ongoing painting projects I want to continue to explore. 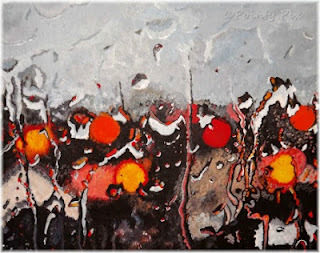 A series on the subject of bushfire, my bubble painting, butterfly painting, paper mosaics, and the use of three dimensional objects like glass beads and gems in my paintings. I have some stencilling plans. I’m also looking at some ‘life inspired’ quotes and the art I can generate from those. 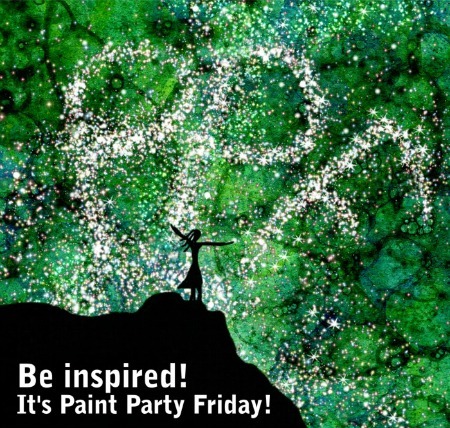 Thanks so much for this opportunity, oh wonderful Paint Party Friday Peeps. I’m honoured to be here! Thank you, Liz! And, thank you for generously sharing the results of your exploration with all of us (Kristin and EVA are both itching to give bubble painting a shot)! Another hopping party last week, filled with such wonderful paintings! Hope everyone has a fun and creative week! Paint Party Friday: Week 22, Year 2 Check-In Share YOUR Story! Hey you (yes, you!)... We want to hear YOUR story! We're looking for your featured artist submission and we can't wait to share it with the rest of the PPF gang! If you paint, we want to hear your story. We all have something to share! It has been fascinating to hear Stephanie S's, Kathy's, Mary's, Marcia's, Patsy's, KAT's, Lisa's, Stephanie C's, Kristin V's, Sigga's, Kat's, Elisa's, Jenny's, Minnemie's, Mimi's, Natasha's, Jessica's, and Nicola's stories and to learn more about each Featured Artist. Such inspiration! Similarities, differences, uniqueness and wonderful paintings. Thank each of you so much. Now, we want to hear YOUR story! p.s. Please send in your interview, otherwise Kristin and EVA are going to end up blathering on about themselves! Ha! 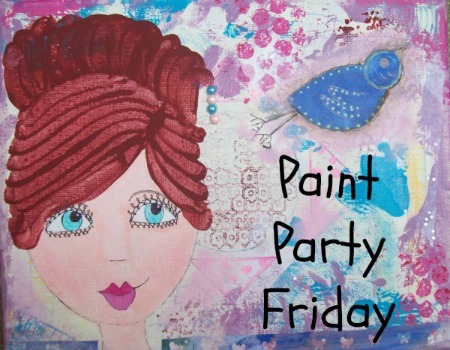 Have a wonderful time at the party and a fun, painting filled week! Welcome to Week 21 of Paint Party Friday (Year 2) and to the next edition of our Featured Artist Series! 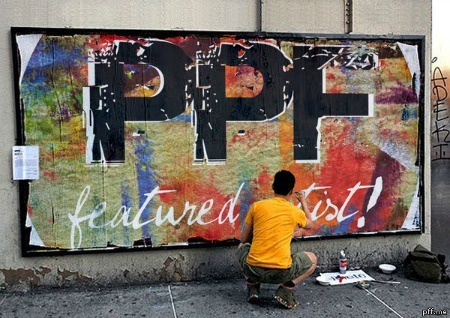 (Would you like to be a PPF Featured Artist? Please click here for details!) 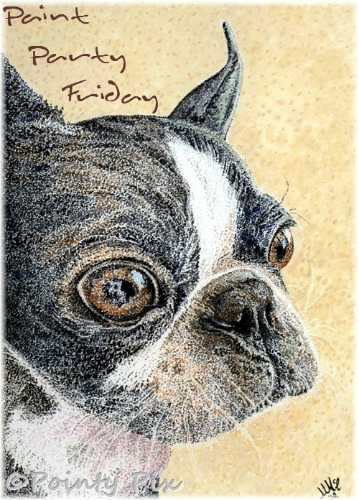 This week's featured artist has been pleasing us with her pawsitively precious pointillist paintings since week 1. Please welcome Nicola from Pointy Pix! 1. Please tell us a bit about your personal history with painting. (When did you start painting? How has your painting evolved since you first started?) I've always loved painting and drawing – one of my earliest photos was taken when mum discovered three year old me drawing all over one of my older sister’s story books! I can remember drawing Disney characters when I was really young and then when I was about 14 my dad letting me paint a mural of Pierrot the sad clown on my bedroom wall (he was very popular on bedroom accessories in the 80s!) I studied art at school right up to A’level (exams we take at 18 - I’m not sure what the equivalent is in American/Australian schools). Although I didn’t go on to do anything remotely creative in my work life, I did return to painting and drawing from time to time over the years, selling watercolour landscapes to tourists in Tunisia when I worked there as a holiday rep and using my artistic skills to brighten up my hotel notice board. I even painted a Christmas scene on a hotel window one year! 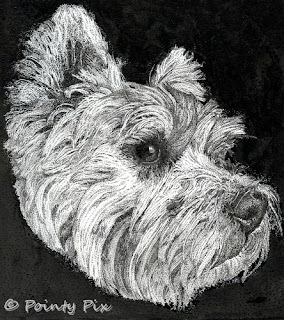 I was asked to do a few caricatures as wedding presents a few years ago and then two years ago my office manager at the time asked me to do a portrait of her dog. She fully encouraged me to follow my dream of turning my hobby into a career. 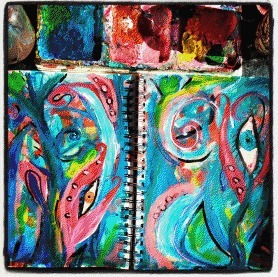 That's when I set up my blog detailing my journey back to art. I’m not there yet but it’s been a very interesting couple of years! 2. What are your favorite techniques, media, and tools to use in creating your paintings? My favourite technique is pointillism – hence the name of my blog. I started off using mainly Indian ink on watercolour paper in a stippling technique (millions of tiny dots like newspaper print) with a very fine nib ink pen or Sakura Micron pens (which cut out the risk of the ink ‘blobbing’!) In the last year I’ve been moving away from ink and falling more in love with acrylics after my husband bought me a set and, on trying them out, I realised that I can paint over any bits I’m not happy with – much more forgiving than watercolour which I do still use but mainly for more illustrative designs, such as my doodimals (doodle animals). I use a pointillism technique with acrylics too in that I apply the paint in little dots as I like the texture it gives to the canvas, although quite often I imagine that my paintings look better if you stand back and squint than if you look at them close up! 3. What is your favorite thing to paint? Why? I would have to say that the natural world is my muse. 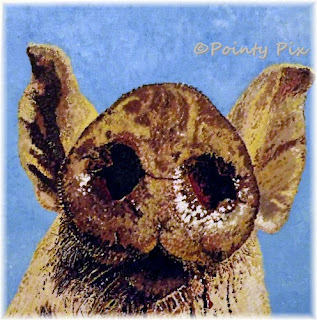 I am hugely passionate about all the critters we share the earth with and big into animal welfare so animals feature heavily in most of my artwork, whether serious or whimsical. I started off doing commissioned companion animal portraits and still do these whenever I get asked but have been working on a series entitled ‘windows to the soul’ based on the depth of emotion and intelligence in an animals’ eyes. I discovered a quote recently which sums it up perfectly – ‘Animals’ eyes have the power to speak a great language’ Martin Buber. As well as animals I love how nature can take something manmade and ugly and sprinkle a little magic on it - even rain (of which we have more than our fair share in Ireland) can work its magic when you look at an otherwise boring street scene through the twinkly blur of a rain-streaked window! I’m working on a series of rainy window scenes and am really enjoying the challenge of making the rain drops look like rain drops (I'm more impressionist than photo-realist!) while still using my pointillism technique where possible. 4. What is your proudest painting moment and/or greatest painting achievement so far? 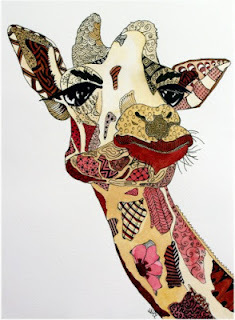 I recently won an online art competition run by Art of Crafts via Pinterest with my Giraffiti doodimal – this was definitely thanks to the wonderful online creative friends I’ve met via Paint Party Friday and Summer of Colour who voted for my painting to win. I was really proud of that. I also sold a painting of an owl's eyes recently and the buyer asked that I give her first refusal on any other animal paintings I do in the future – that’s a wonderful feeling! 5. What's next in your painting future? I’ve been getting braver and contacting more people and companies in the art world with regard to my work. I plan to keep on building a body of work and then I want to approach galleries with a view to representing me or allowing me to exhibit. I am working on developing a thick skin for the, no doubt, many times when I’m not successful and keeping a positive attitude that, if I knock on enough arty doors, then someday I will be a professional artist!